Designed to increase safety while cycling at night, designer Mitchell Silva created a clever light system that integrates LEDs into a bike’s handlebar. Dubbed Glo-Bar, this simple idea consists of low-energy lights placed along the handlebars to illuminate the road and improve a cyclist’s visibility to oncoming traffic. 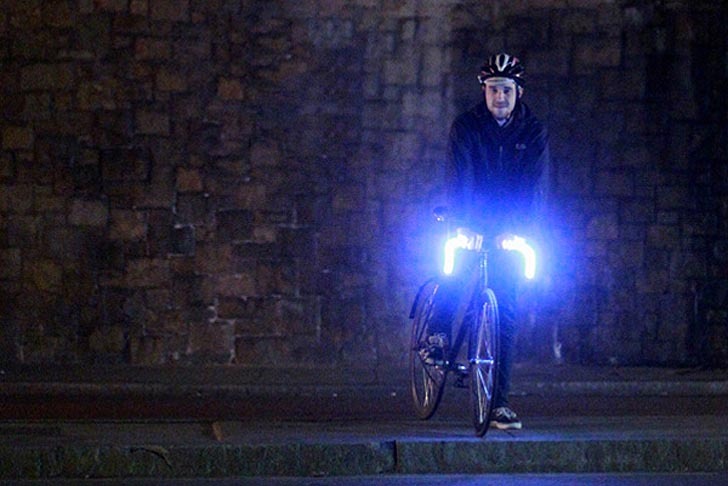 The biker can also use the lights as turn signals by simply pressing a button on either side. Thoughtful and low-energy, this glowing set of handlebars will make riding at night a much more enjoyable and safe experience. Designed to increase safety while cycling at night, designer Mitchell Silva created a clever light system that integrates LEDs into a bike's handlebar. Dubbed Glo-Bar, this simple idea consists of low-energy lights placed along the handlebars to illuminate the road and improve a cyclist's visibility to oncoming traffic. The biker can also use the lights as turn signals by simply pressing a button on either side. Thoughtful and low-energy, this glowing set of handlebars will make riding at night a much more enjoyable and safe experience.